Over the last few years the Georgian capital of Tbilisi has garnered a reputation for having one of the best techno scenes in the world – a surprising turn of events, perhaps, given the former Soviet republic’s tumultuous past and difficult present. The strength of the Georgian scene – and it’s particular political dimensions – was further demonstrated earlier this year, when police raids on the legendary club Bassiani sparked off a gigantic ‘protest rave’ outside of the Georgian parliament buildings which, in all honesty, looks like it may well have been the best party of 2018. It seems that if you’re into techno, Georgia is a good place to be, whether you’re a producer, a DJ or just a fan. One of the many talented producers to have come out of this scene is Saphileaum, aka Andro Gogibedashvili. He’s released on Oslated before, having contributed a sultry ambient techno remix of ‘Karusellplan’ for Eyvind Blix’s album Västberga Allé. Now he’s back with his first album for Oslated, Uninhibited Kingdom, a painstakingly assembled collection of mind-bending dub techno cuts. Album opener ‘No Clue of Life’ is a brooding, slow-burning piece of quasi-ambient techno, combining insectile noises, psychedelic sounds and sanded-down synth stabs with a hollowed-out kick rhythm that seems to be there more to mark time than to inspire movement. The sound design is impressive, but overall something about the track is a little lacking to my ears – it’s probably my least favourite tune on the album, and the one I found myself skipping most often on re-listens. Fortunately, however, it’s followed up by ‘Lost in the Forest’, which is easily one of the strongest tracks Saphileaum has on offer here. The soundscape reminded me a little of the kinds of noises found in some of the darker varieties of psytrance: alien-sounding bubbling and bleeping, ethnic hand-drum percussion samples, but the reverb-heavy loping kick pattern they were bolted on top of made it very clear that we were very much deep in dub-techno territory. Around midway through the appearance a series of piercing minor-key synth chords really kicks the track into a higher gear; it becomes completely hypnotic and bewitching, and I can easily imagine it absolutely devastating certain kinds of dancefloors in the hands of the right DJ. Lost in the Forest is a strong contender for the title of ‘best track’ on the album. The next track, ‘Abandoned Fortress’, is by contrast much warmer and gentler. Featuring another shuffled beat, the track uses soft, sometimes euphoric evolving pads, a perky offbeat melody and some more interesting tribal percussion loops and rhythms to create a soothing sense of calm and tranquility; it evokes the abandoned fortress of the title, sure, but rather than being a grim and desolate place, this abandoned fortress is lush with tropical plants and crowded with wild animals, teeming with life, like Chernobyl in the years after it was abandoned by humanity. The happy, upbeat tone of ‘Abandoned Fortress’ doesn’t linger for long, however. ‘Treated by Herbs and Fire’ is a serious and dramatic piece, once again featuring the now-familiar staggered kick rhythm and pairing it with resonant metal-on-metal percussion. A cosmic abyss of bass undulates throughout the track, accompanied by the sounds of chanting voices that rise and fall like a strip of ribbon twisting through the air. Snatches of digital birdsong and stark bursts of saw-wave complete the piece, and when taken together the whole thing feels as if it would work well as the soundtrack to something or other, though I’m not sure exactly what. The final original track on the album, ‘Dual Expression’, maintains a similar sort of tone and atmosphere: vintage-sounding synth tones echo beneath a high-pitched ringing sound, like the sound of noise being coaxed from the rim of a wine glass, highlighted by more drum-circle polyrhythms, all firmly anchored by a classic dub beat. The strong sound design on display here merits special mention once again; the subtly phased and layered snare drum, the rise and fall of pads evoking the sound of whalesong, the way that all of the intricate percussive elements sweep and glide around one another. The next four tracks on the album are all remixes by various Oslated affiliates. The first is a remix of the album opener, “No Clue of Life”, by Spanish-born, Vietnam based producer Javier Marimon. Marimon’s remix takes things a little deeper, by and large preserving the labyrinthine sonic details and effects of the original, but layering them over a sinuous Northern Electronics-style wave of sub-bass. There’s no real sense of progress here; sounds simply play off of themselves, repeat and refract into infinity, creating a sense of darkened ambience, like shadows dancing around the edge of a mirror. Marimon’s remix is followed by a remix of ‘Lost in the Forest’ by Romi. In this mix Romi, currently based in Hong Kong, serves up a claustrophobic, paranoid take on Saphileaum’s dubby roller; noxious pads descend over the track’s distant sub-bass rumble like chem-trails spewing out from a squadron unmarked jet-black fighter planes, while halfway through an urgent shaker rhythm and acid-like bass and synth squelches lend the tune a feeling of groove and movement. Vice City’s remix of Treated by Herbs and Fire is a personal favourite of mine. The next remix, a version of ‘Treated by Herbs and Fire’ by Vice City, is far and away my favourite track on the entire album. Vice City, who hails from Taiwan, reportedly draws her inspiration from nature, science, philosophy and mythology, and I felt like I could catch a glimpse of some of these inspirations while listening to this remix. Her command of sound design and construction is, in a word, exquisite; within the first 20 seconds of the mix I had already become thoroughly lost within all of the dizzying richness and texture of the track. 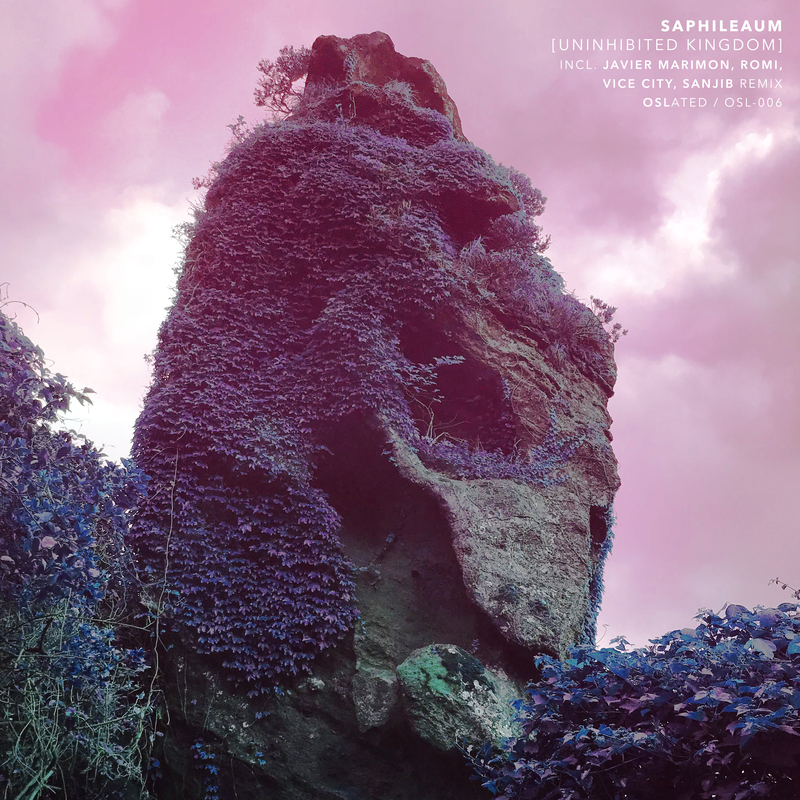 It’s as if she had carefully dissected Saphileaum’s original track one precise incision at a time, eventually pulling it wide open to reveal entire unexpected universes within. She preserves a lot of the original chords and patterns of the original, but presents them to the listener in stunningly imaginative and unexpected ways. It’s a largely ambient piece, but a beat does slowly emerge over the course of the track – slowly and haltingly, shuddering every step of the way and threatening to collapse in on itself at any moment, until all of a sudden it comes into focus fully formed and ready to kill. This is another track that I can imagine being incredibly effective if mixed into the right set, though it would take a lot of skill on the part of the DJ in order to pull it off correctly. The final tune on the album, a remix of “Dual Expression” by Sanjib, places the emphasis firmly on the production. Sanjib is a side-project of techno producer Jibis, who operates out of Lyon, France; Sanjib is apparently the moniker he uses for more “emotional” or personal projects. For this remix, he takes the hints of tribal techno scattered throughout Saphileaum’s debut and brings them to the fore, creating one of the most directly dancefloor-oriented cuts on album as a result; I can easily imagine that I’ll be hearing this particular track on the floor of vurt. or Volnost over the next few months. Of particular delight is the crushing bassweight of the piece – the sub really sinks into your bones – and the rattling, clanking percussion fills, like the sound of a box of pots and pans falling down a spiral steel staircase, but in reverse. It’s a good tune, for sure, but sadly I think it’s a bit overshadowed by the excellence of the Vice City remix that came before – personally, I would have rather the album ended with that. Uninhibited Kingdom is an impressive album. Saphileaum has a fantastic ear for soundcraft, and his original tracks successfully invoke a wide variety of feelings and emotions in the listener. If I have a small complaint, it’s that his sound pallette felt a little limited at times; I heard variations of the same set of sounds being used in just about every track. Then again, this may have been a deliberate decision on his part – it has the effect of creating a sense of continuity and coherency throughout the album. I would have still preferred it if he’d stretched himself a little more, though, but that’s just my opinion. And thankfully, the four remixers do a great job of adding in some new elements and changing up the pace and atmosphere of the album, so overall the whole thing still works very well as a continuous listen. If, like me, you have a soft spot for dub techno, I can definitely recommend giving Uninhibited Kingdom a spin. Uninhibited Kingdom is available for purchase over at Oslated’s Bandcamp.